This exquisitely furnished 3BR all ensuite bathroom Villa with private pool and 200m to the beach, comes with all amenities & truly premium fit out. European open kitchen, big Bedrooms, lounge, SAUNA, carport and a sizeable living room and sun decks. This exquisitely furnished 3BR Villa w. private pool comes with all amenities & great fit out. Flatscreen TVs, sound systems, a massive Master Bedroom with walk in closet, open kitchen and private garage and 3 ensuite bathrooms and sofas around. This 160sqm private pool villa is fitted to the great standards. It boast 3 sizeable bedrooms, of which all 3 have ensuite bathroom. The Master bedroom is facing the pool. 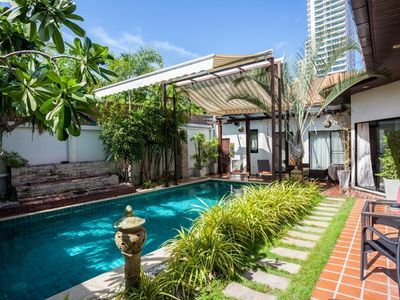 This house is complete with 1 huge open kitchen and appliances, whereby a second open thai kitchen is located to the back. The house has satellite TV, Wifi, 4 Flatscreen TVs. This house is a great property, with all amenities, complete with linen, towels and regulate housekeeping, located in a well maintained village and proximity to the beach with private access. Walking street is only 10 minutes near.